Cats love to drink milk, so it is unfortunate that the lactose found in normal cow milk can make it difficult to digest. 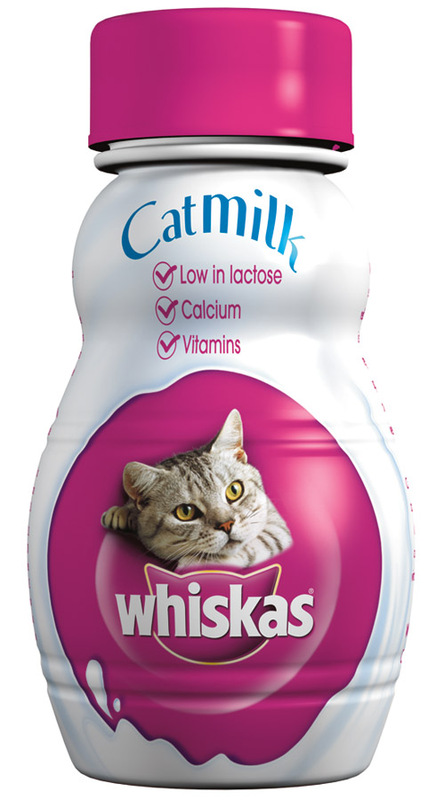 Luckily Whiskas have produced Cat Milk which is a healthier alternative to cow milk and has been specially formulated by vets and top nutritionists to be much better for cats. Suitable for kittens and cats over 6 weeks age. Milk and milk derivatives, Derivatives of vegetable origin, Minerals. Below are some recent questions we've received regarding Whiskas Cat Milk, including answers from our team. I bought some bottled a while ago and want to check its expire date. Is the date printed on bottle the expire date or the production date please? And how long does it last? The date printed on the bottle is the "Best before" date. It should be safe to use for some while after that date, depending mostly on the storage temperature, but its palatability and nutritional value may well be reduced. How long will the milk last once open? Once opened the milk needs to be kept in the refrigerator. It will keep for about a week in the fridge. It is recommended that it should be brought down to room temperature for maximum enjoyment.